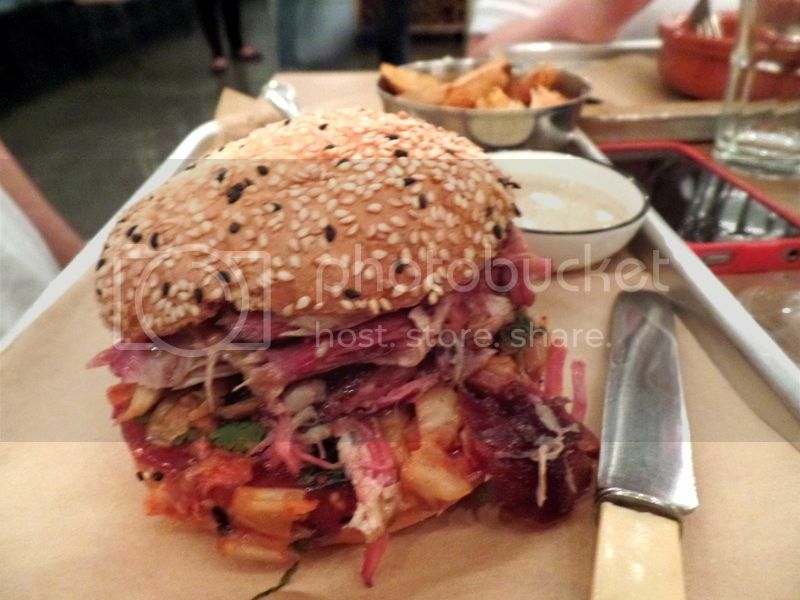 This post is based on two very fantastic experiences at Hoghouse in Ndebeni (next to Pinelands). The first one was my birthday party where they happily hosted about 25 of us upstairs. And the second one was a more intimate dinner of four with beer tasting and shared plates. I actually live in Pinelands and a lot of people give me much grief about my boring little suburb! So I personally owe The Hog House a huge thanks for making Pinelands a little cool. And yes – everyone is telling me it’s Ndebeni not Pinelands – BUT I’M CLAIMING IT! 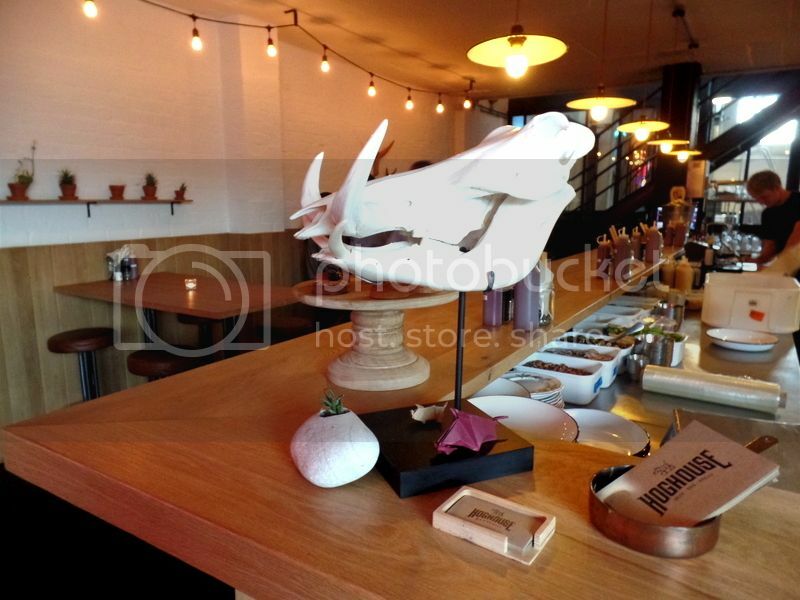 Hoghouse is a really gorgeous spot with lots of light and open space. It truly is the coolest spot in Pinelands! For my birthday party they hosted 25 of us upstairs. We had the entire space to ourselves and we got to move chairs around and be as noisy as we like- and it came with our own personal waitress! I always struggle with birthday restaurants because we tend to be a large group! But Hoghouse was an absolute dream! I would highly recommend booking with them for a large festive party. When we visited the first time they didn’t have their liquor license yet so we all brought our own wine and this went a long way to keeping the bill down! However, on our next visit (only one week later) they had their liquor license! Hoghouse is also a brewing company and we really enjoyed trying their beer tasting! Their tasting flight is R30 for four tasters as pictured above. It is a fantastic way to work out what full beer you want to order next! I enjoyed the Hogwash the most which is an Amber Ale. They have a great variety of beer and they are really reasonably priced! Make sure to take the beer lovers in your life! 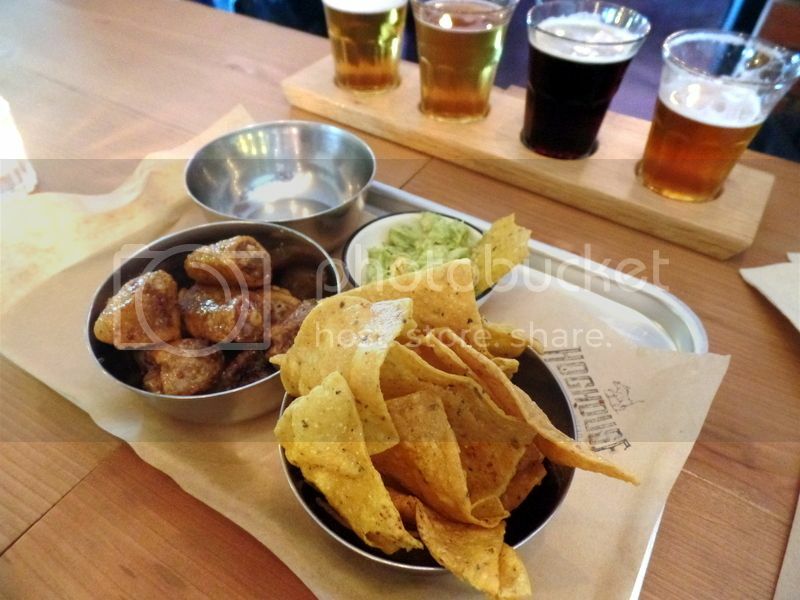 With our beer tasting we decided to create our own bar snacks with their starter menu! Our winning choice was definitely the crispy, crunchy, sweet pig tails! I actually really love pig tails and I know it is something to get your head around – but you should be brave and give it a try! The crunchy salty nachos with guacamole was another fantastic pairing with the beers! I actually want to talk about this review in a backwards kind of fashion. 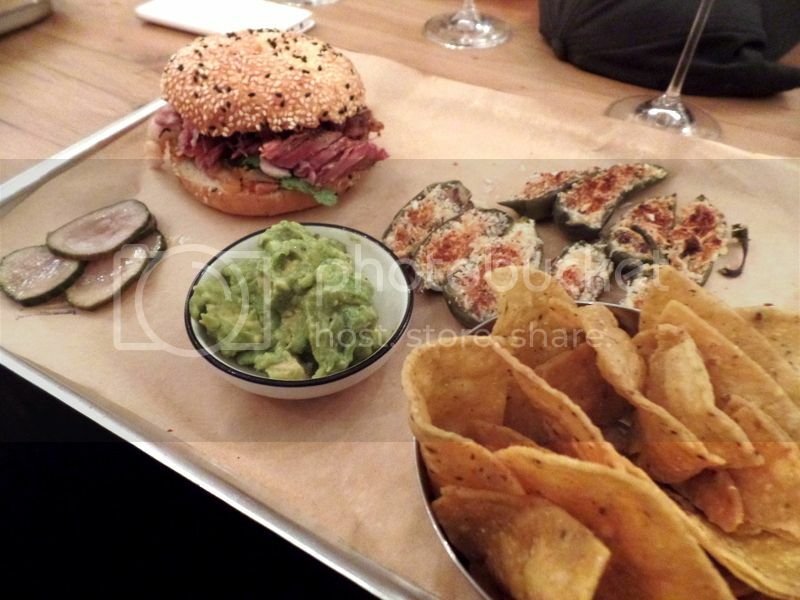 The Hoghouse sounds like a perfect destination for meat eaters! For my birthday party three of our group are vegetarians and I was a little worried about them. I was beyond delights to find many fantastic veggie choices! In fact my favourite dish out of Hoghouse is the baked aubergine with tomato, mozzarella and basil! This is the most gorgeous gooey cheesy comfort food dish. We ordered it on both our visits and it came out as a winning dish both times! I would seriously recommend this as a must order side! 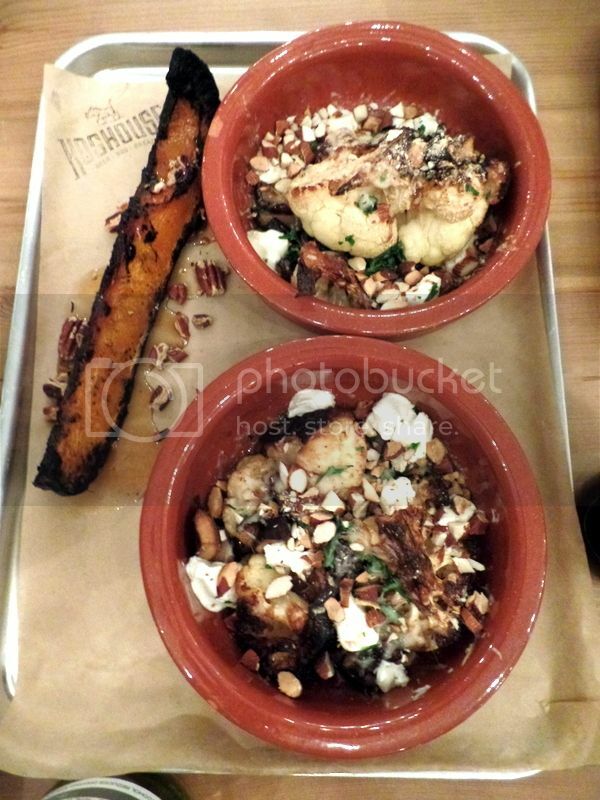 Other fantastic veggie options include the cauliflower with goats cheese, almonds, capers and shitake. The charred butternut with maple syrup and pecan nuts is great and I actually replicated it at home for our New Years Eve party! 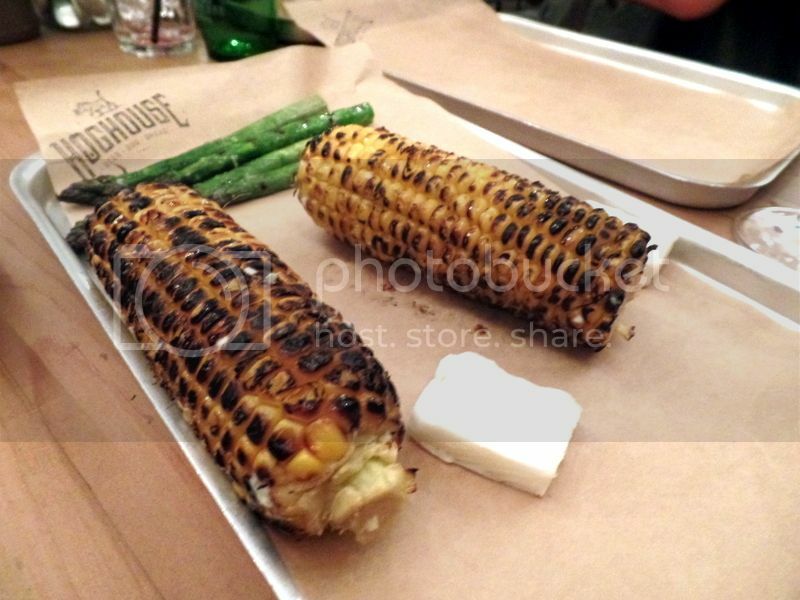 The fire roasted corn on the cob with goats butter is really moreish and fantastic with the salty goats butter. 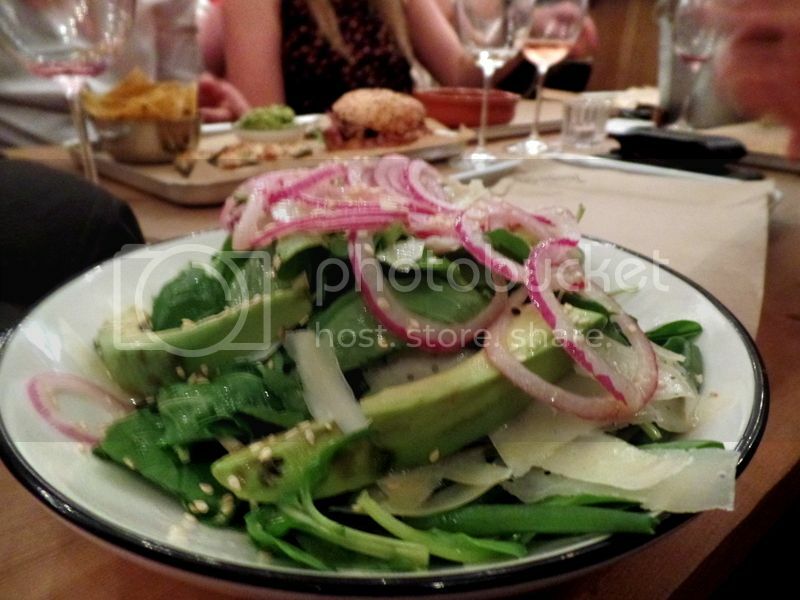 Other healthy and vegetarian options are the fire roasted asparagus and salad of rocket, watercress, avo, green beans, sesame and Parmesan. So the point is – the vegetarians have got plenty to eat so long as they are happy to order a few sides and create their own main meal. 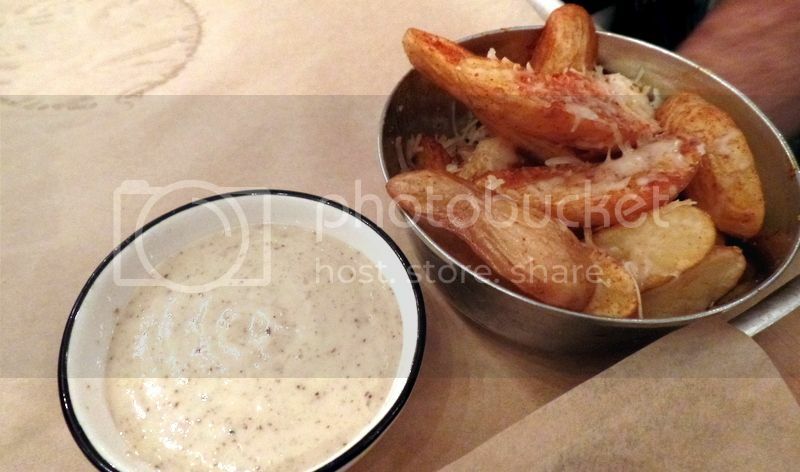 My other must order side is the duck fat potatoes with Parmesan and truffle aioli. The four of us ordered two servings to share. This was a good idea but my inner glutton wanted more!! The potatoes have an amazing crispy outside with a soft squishy potato inside. And the truffle aioli is just unbelievable! 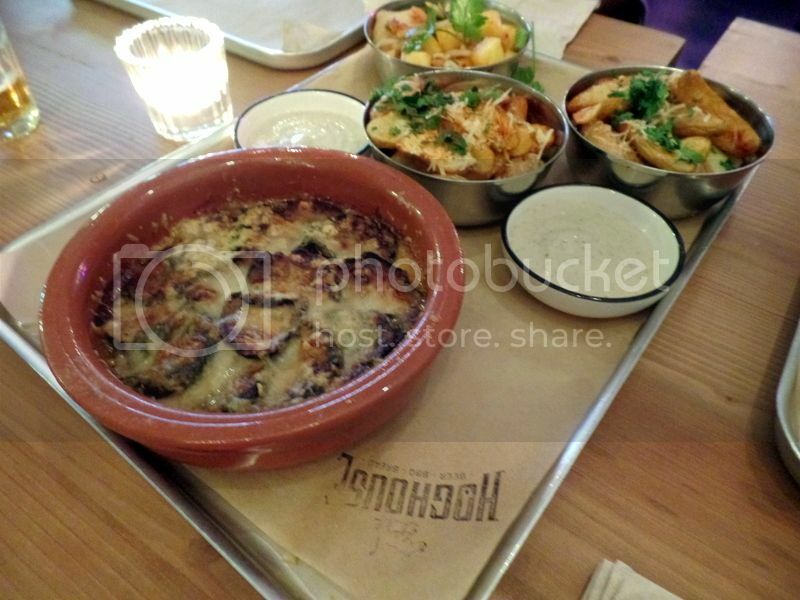 Luckily they are generous with the serving and there’s plenty for all the potatoes! 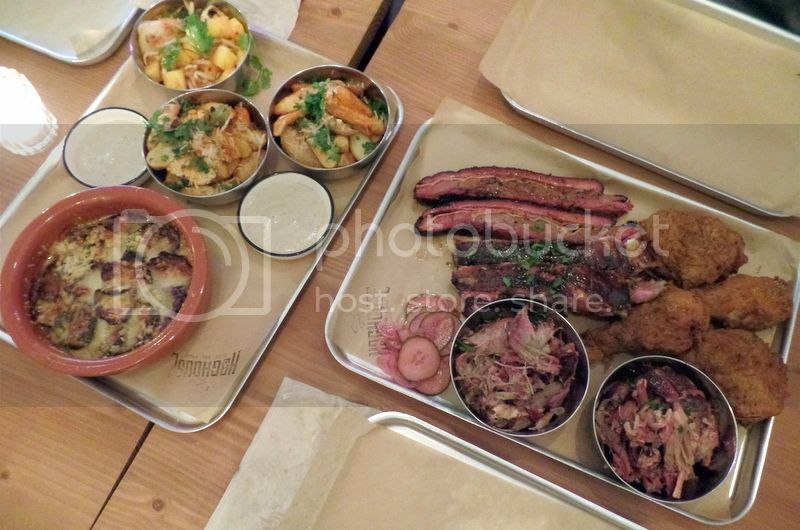 Hoghouse can be a little pricey if you order lots of meats from the barbeque and sides. One way of keeping the bill down is to order one of their amazing buns! There’s a brisket bun with bread and butter pickles and watercress and a pulled pork bun with hoisin sauce, coriander and kimchi. And these guys will only set you back R80 a bun and are really filling! My favourite was the pulled pork bun which was really tender and packed with flavour. However some of my friends preferred the brisket bun as they found the Hoisin sauce a little overpowering on the pork bun! Hanging in the right corner of the above photo are the chilli poppers! These were cooking and my mouth was on fire! The fire breathers at our table were happy but I could not cope! At one point my eyes were running and I was smashing the nachos and guacamole to deal with the pain! So please be warned – these chilli poppers are HOT HOT HOT! On our second visit I made an effort to eat more and not simply run around getting excited about it being my birthday! They recommend ordering between 200-300g of meats if you’re picking items from the barbeque. What that translates to is about 2-3 dishes per person. We opted for two each as we had starters, lots of sides and dessert intentions. There was more than enough food and we left very full! My favourite of the meat options was the buttermilk fried chicken! I have a serious weakness for buttermilk fried chicken as my mom used to make it for us as a treat when we were little – which was super exciting in our overboard healthy household! The chicken has a fantastic crispy coating and seriously tender chicken! This dish is a huge winner and even better when dipped in the truffle aioli from the duck fat potatoes!! 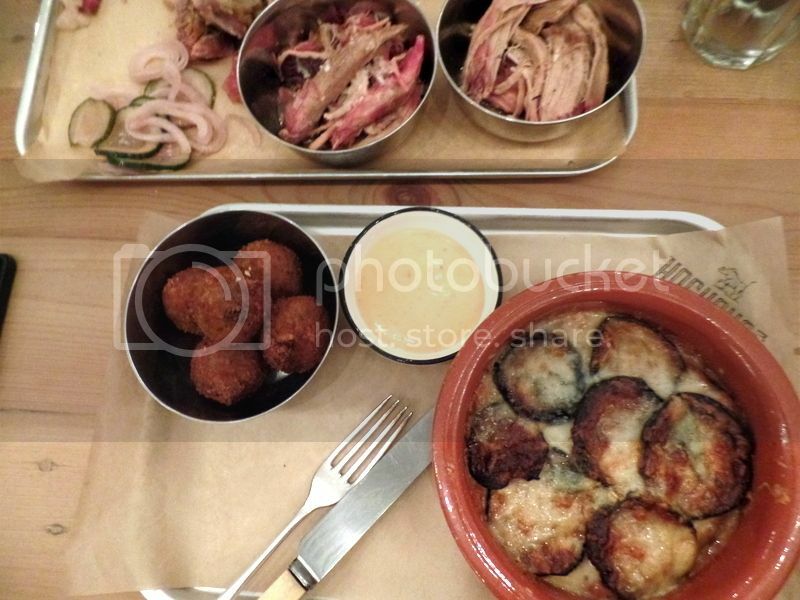 I also really enjoyed the pulled pork and the pork belly! These slow cooked and sweeter meats were amazing with the pineapple kimchi with coriander, bean sprouts and peanuts as this was both sweet and acidic! Gourmet smoke house pairings! I wasn’t really keen on the beef brisket or the pork spare ribs. However the beef brisket was a big favourite around the table. We couldn’t resist having dessert on our second visit! 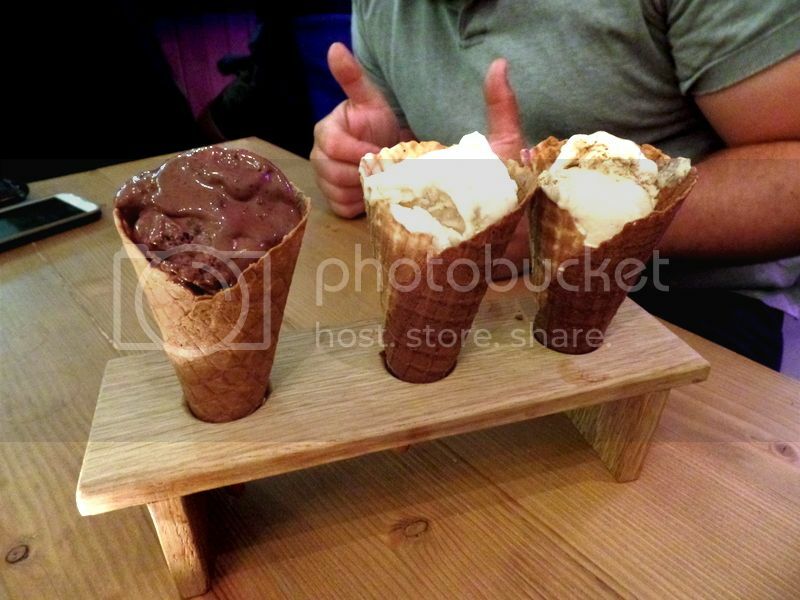 We had these beautiful sugar cones with ice cream as a small sweet finish! I went with a scoop of Hertzoggie flavoured ice cream! I am obsessed with Hertzoggies which is an apricot and coconut tart. It made for a fantastic scoop of ice cream and I’m a converted fan! The boys went with a scoop of chocolate and salted caramel each. The salted caramel was another great choice! 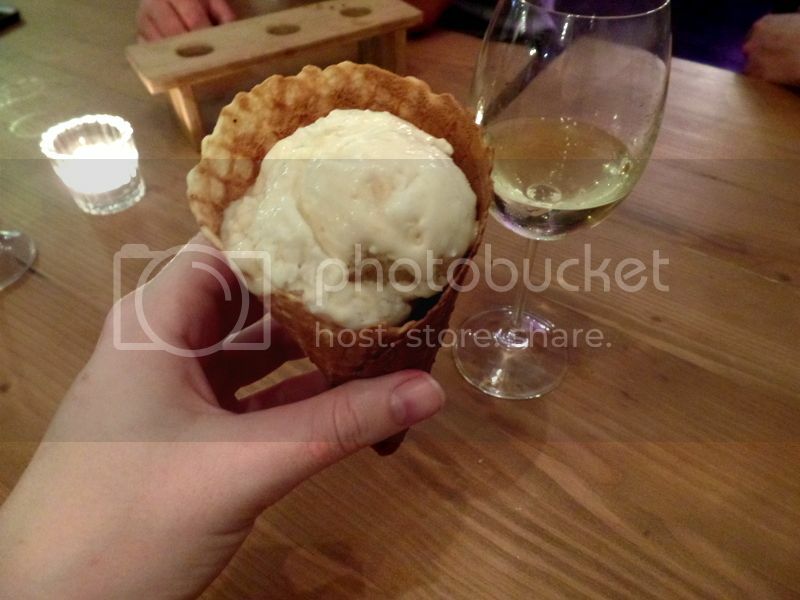 They also serve sorbet in a bowl with seasonal flavours. We tried the gin and tonic sorbet and it was really incredible! I would definitely order this again! Bitter and frosty and delicious! The ice creams aren’t very big so make sure to find a little space for them! Hoghouse is such a gem and I’m looking forward to becoming a regular! I have pretty much tried the entire menu and I can’t fault them on anything! They are super popular and getting really busy – so make sure to call ahead to book! It is family friendly and there are often larger family groups – but they tend to clear out by 7:30/8pm so book later if you’re hoping for a more grown up evening out!